Bridge foundations are typically pile foundations that do not settle. 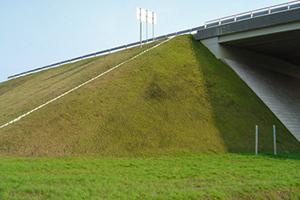 At the same time bridge abutments are built on soil and always have some degree of settlement, constarntly causing a problem at the earthwork-bridge joint. 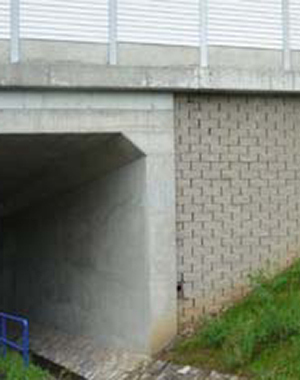 If the bankseat is placed on the abutment and the rising wall is tied to a reinforced soil bridgehead, this phenomenon is eliminated and the bridgehead moves together with the abutment. 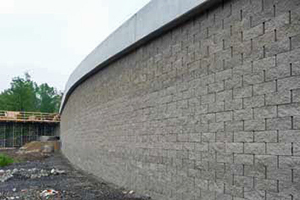 At the same time the deep foundation is eliminated resulting in further cost saving. Based on experience in the construction of reinforced soil structures and foundations over poor soils, combined with achievements in the acceleration of consolidation, Gradex Ltd. offers to participate in the designing of reinforced soil bridgeheads and carrying out their construction.